Despite not being perfect, with shadows and reflections and a very uneven border, isn’t this a beautiful picture and a beautiful message? I asked FH today “I wonder how much time I spend wishing I had a flat stomach.” He said, “Really?” And then he went on to tell me at most of the burlesque shows he’s seen, I would have been the skinniest woman in the room. Okay. But still. We’re talking about self image, not “real image”, right? Finally I said, “I wonder how much time women [and some men] world-wide spend thinking about this, wishing for a ‘more perfect’ body? It must be so much thought and so much energy. If we could all stop, and somehow collect that energy, we could probably create world peace!” We really laughed for a while about that. But really? Why do we worry so much? We know all the magazine and billboard images of the female body are airbrushed. We know the capitalist marketers want us to feel like we’re crap so we’ll buy more stuff. We know we’re not in our twenties, or even our thirties any more. We have partners who love us even when we wake up looking like total crud (I’m very thankful for this, and if it’s not yet true for you, dear reader, worry not–he or she will show up!). So why do we worry? Why do I worry? This is something for me to let go of. I could have a lot more energy if I didn’t waste it on this. I didn’t take a shower today, didn’t wear makeup, wore yesterday’s clothes, and had a perfectly fine day. I ate what I wanted. I didn’t exercise much and didn’t feel guilty about it. It was just a day in the life of me, as I am. This entry was posted in Uncategorized and tagged beauty, care of the self by Project Easier. Bookmark the permalink. Hi! Thanks for visiting my blog! I have to tell, this is one of my favorite posts! Hi – I’m here from ICLW. Great post! So true!! 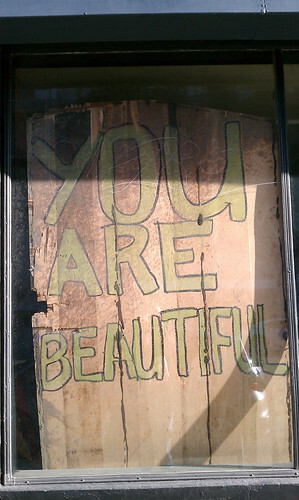 We are all imperfectly beautiful. Thanks for reading! I love that post and havent thiught about it in a while. I appreciate your visit! Whats your blog?